I am after improving crumb structure of my Panettone. Things I know are , Autolyse improves crumb structure, slow mixing reduces oxidization and promotes slow dough development followed by S&Fs. Strong Flour has more elasticity , and hydration helps extensibility. Here I am counting yolks to be %50 water. At %100 dough was incredibly tender. Like when cut in half it collapsed on itself, SUPER feathery. Can we even apply Autolyse on Panettone? Can we Autolyse with yolks? The initial dough around %60 with the yolks. Too Dry? Will it even help since there are First and Second dough? Most rich doughs are mixed in faster speeds? But slow mixing is beneficial for molten "open crumb". Would mixing on 1 speed be enough to create just enough gluten for the 12 rise (yolk/butter/sugar included)? Would you need to build any structure since you are going to break it again in the second dough's mix. Do you need any structure (any S&F) at all since you are proofing it in a mold ? Can you retard rich dough? I mean butter solidifies, would it break gluten. In Second dough could you add the butter chunks last after the raisins and candied stuff and actually expect the same result on croissant or pie where the crumb opens up due to the water content in the butter ? These are just some ideas, I am going to try these anyway but I was just wondering if anybody tried any of these. You should always autolyse whatever looks like flour : it helps developing aromas and, more crucially, breaks down complex sugars into simpler ones, which then will easily be digested by yeast. True for bread, brioches, panetones, pies, blinis, or whatever you try and make with flour. You could also opt for a higher hydration, like 70 or 75%, which IMHO would give you a thinner and more souple crust, as well as a soft, light and bubbly texture at heart. You probably should reduce your oven's temperature a bit after you put your dough in, and make sure there's enough steam for the oven kick. You need to be very delicate with this kind of dough, when shaping it. You could also stabilize the dough, once proofed, by putting it in a cold fridge for a good couple hours. Whatever you wanna incorporate into it, do it just before proofing, by giving it a good slow robot mix. Don't overlook the necessity of cold fermentation : with this kind of doughs, the taste is a must. If you wanna get complex flavors, you're gonna need some time, preferably 3 or 4 days around 1 or 2 C°. It stabilizes the first proofing, and ensures all of the gluten and sugar proteins have been broken down or digested. Best regards and have fun. I ll try the retarding. I am actually at 85% to 100% . At first I was complaining about how feathery and soft it was. But yesterday, I upped the butter to 45% and reduced the water to 75% and I got good results. I did not fully incorporated the butter I added it after full gluten dev. The dough was like mozzarella. But I am gonna up the water back to 85 to 100 and try the same amount of butter and see how it behaves. Also I Usually build the levito Madre with 3 feeds. Doubling the amount at each feed. Then I build first dough and after 9-12 hours I build the final dough. I am going to go back to drawing board to do a regular sourdough like recipe with one dough and levain. Light mix for 15 min s&F and bake. This might give me better results. 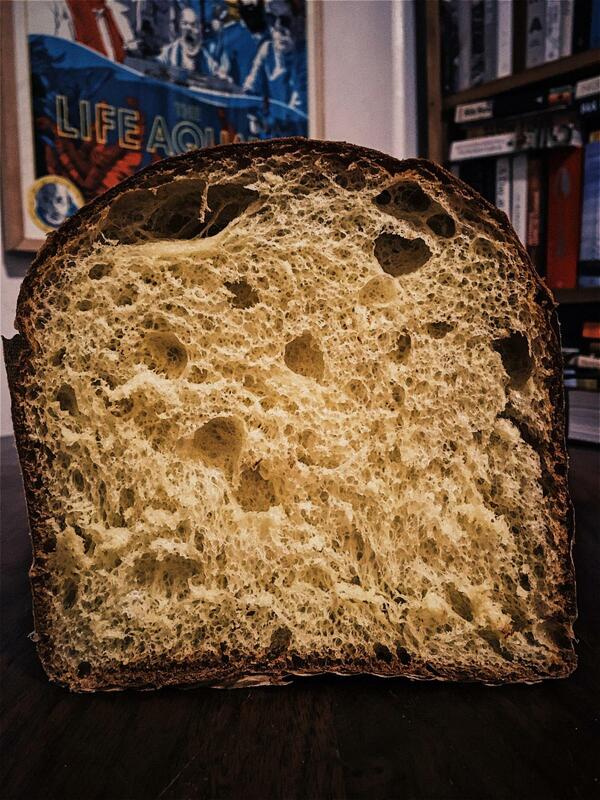 Maybe not 100 panettone flavor but better crumb. I am trying to get something close to Roy's . I can't answer your questions! But wanted to say it's look really nice!